"as the number of viewers has grown from thousands to millions, Joan Gilbert's personality has remained a provocative talking point." The outstanding success of the pioneering days of British television was, without doubt, Picture Page. The magazine show, which had a running time of an hour, with two editions a week, was one of the first television programmes to win major acclaim. The programme featured general and topical interest features which were linked together by Joan Miller, known as the Switchboard Girl. 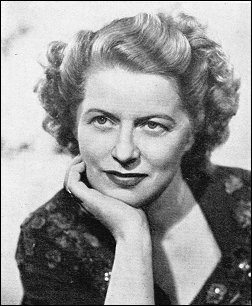 The programme was edited from 1936 onwards by Joan Gilbert. Born in 1906, Joan Gilbert came into television by way of radio's In Town To-night. She joined the BBC administrative staff as a result of a golf match between her father and a BBC official. She was drafted to the sound radio variety department as a typist-secretary. Her boss there was W. H. Hanson, the original producer of In Town To-night. In the weekly scamper to put that programme on the air Joan Gilbert soon found herself carrying more of the work than would normally be expected from someone in this position and was acting far more of a personal assistant to Hanson. When Hanson suddenly died in 1937, in tragic circumstances, Joan Gilbert left. Up at Alexandra Palace, Cecil Madden was editing a new kind of television programme called Picture Page. Joan was offered and accepted the job of reporter, her task being to seek the newsworthy personalities of the programme on a weekly basis. It wasn't long before she became assistant editor to Picture Page. When the BBC was forced to close down at the outbreak of World War 2 Joan Gilbert held a variety of jobs, all of them in the front line of wartime radio broadcasting. Eventually she was conducting some of the most popular radio programmes for the Forces. At long last the Television Service was opened up again, and in 1946 it was decided that Picture Page should be one of the post-war programmes to return to the TV screens. Joan Gilbert was offered the editors job and there was no intention of her appearing on screen, but by the time the first Picture Page was put together nobody suitable had been found to host the programme. So she went in and did it herself. With the exception of two intervals, when she was ill, and the job fell to BBC announcer Mary Malcolm, Joan Gilbert continued to host the show. Each weekly edition of Picture Page was rehearsed from about 4.30pm on the day of transmission. Joan Gilbert and interviewer Leslie Mitchell met up with the personalities who were to appear in the show and, with the producer, they ran through the order and general presentation of the programme giving each guest the opportunity to become familiar with their surroundings as well as (this still being the early days of television) the paraphernalia in the television studio, so as not to feel intimidated during the live broadcast. Following a break of about thirty minutes Joan would then break the ice a little further by inviting everyone into her dressing room for a pre-transmission drink. The next morning Joan would be back in her office opposite Madame Tussaud's in Baker Street with a new show to plan and although she had a team of scout reporters looking for newsworthy items and people to interview she had the final say on who and what would appear. As the show went out on a Wednesday it was quite possible that changes had to be made as late on as Tuesday night if a newsworthy item was to come up. It was estimated that by 1950 Joan had found around 1,500 personalities for Picture Page. However, it would seem as though Joan Gilbert won as many critics as fans. The 1952 Television Annual describes Joan as having "an irrepressible, almost irresponsible vivacity which goes on winning her legions of admirers of both sexes" whilst just a year later, the same publication notes "as the number of viewers has grown from thousands to millions, Joan Gilbert's personality has remained a provocative talking point." The article calls her both "effervescent and unpredictable" and sums her up by saying "on screen, charmingly belying her twenty years in the employ of the BBC, she is amusing, worried, chirpy, erratic and still unpredictable. And still the viewing families argue about her." 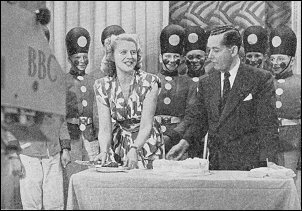 By 1951 Picture Page had become the longest running TV programme in the world but the BBC, "far from satisfied with Picture Page," were doubting whether or not it should continue. For one reason or another Picture Page began to look as though it was having a chequered career. Its standard became erratic; viewers were divided in opinion - they either liked it, or they could see nothing in it, they liked Joan Gilbert, they were irritated by Joan Gilbert and somewhere among the reasons for the programme's ups and downs was a silent struggle by Joan with bouts of ill health. The BBC's answer was to give the programme a three month break before returning it with a new producer with the command to streamline it. A polished snappier version appeared but viewers didn't take to it. TV chief's cancelled the programme and replaced it with Week-end Magazine. In essence it was the same programme with a different name, and still presented by Joan Gilbert with her "irrepressible and unscripted charms" that made every interview "something like an uncharted expedition." 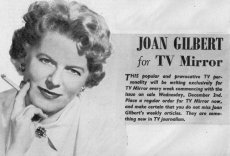 In the summer of 1953 Joan Gilbert left the BBC as an employee to become freelance and also began a regular column in the television magazine TV Mirror (commencing 2 December until 20 August 1955). The following year she appeared in a special programme alongside Cecil Madden and Joan Miller that marked the closing of the studios at Alexandra Palace and continued to work on the new wave of Women's Programmes on BBC Television such as About the Home. 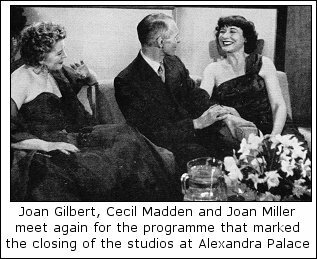 After 1957 Joan Gilbert seems to have disappeared from public view and I have been unable to find out what she did once her television career finished. She passed away in 1991. 'I was perched 40 feet up, by the Great West Door of the Abbey on a wooden platform 14 feet long and just 2 feet wide. The high and apparently slender structure, we were warned, would accomodate 10 people!